When I was a little girl my grandmother used to call me Precious Pearl. The name came to be because there was a doll called Poor Pitiful Pearl. I’ve been told that I used to mostly walk around with a grumpy look on my face. I don’t doubt it. Many of the photos I’ve seen of me show that little scrunched up face underneath my oh-so stylish bowl cut, and my arms crossed across my chest with a “don’t mess with me” look. She loved me no matter my grumpy face or not so the “Poor Pitiful” part was dropped for “Precious”. She passed away when I was in college back in 1996. I can still remember her voice. There are smells that can bring me right back to her kitchen in Tequesta, Florida. One of my favorite pictures of her is one I took in high school, sitting at my kitchen table in Vermont, looking at me lovingly, no doubt in my mind saying “Precious Pearl” to herself. I did a shoot with her big brother four years ago. I loved it so much then and still do to this day. Unlike the last shoot he wanted ZERO to do with this session. There were a lot of tears but he did finally come around at the end. And I got a smile from him, even though he tried his best to *never* give in! This gave me lots of time to focus on Violet and the interaction between her and her mother. There is something so pure and raw about a mother’s love for her children. Motherhood photography is something that I hold near and dear to my heart. I feel fulfilled when I am lucky enough to be witness to these moments. 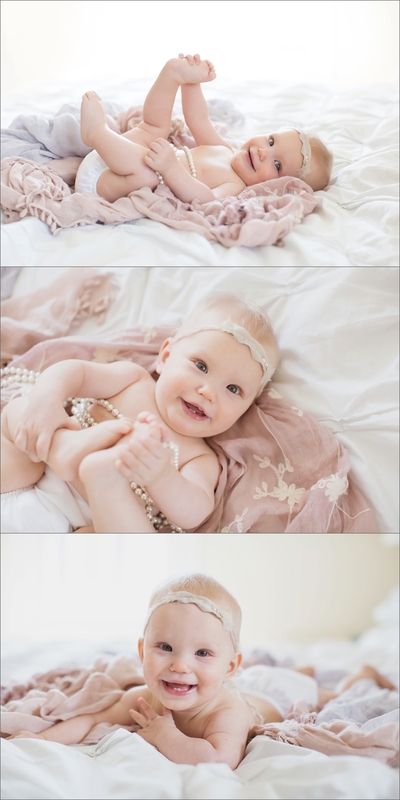 Mom wanted to incorporate some of her own pearls for this shoot and I love the feminine, opalescent strands draping over her beautiful baby skin. I would LOVE to capture these precious moments with you and your little ones! If you are interested in setting up a mommy and me session or incorporating all your loved ones for a family portraits I would love to speak with you! Louise Bagger - Thank you for sharing those precious motherly photography, there was a charm in those smiles and innocent looks. It really brings back mine memory when i did have those innocent smiles and looks that forced others elders to play with me. It was a beautiful moments.